Mean To Meaningful is a gritty memoir that chronicles the journey of an angry mean spirited violence-prone boy, who is a few cards short of a full deck, living on the edge just one breath away from homelessness. The book begins as a story of confusion, neglect, poverty, and shame, but as this painful journey unfolds the story changes. Along the way there are challenging life circumstances filled with destructive behaviors. A handful of well-timed God winks enable him to survive high school. Then a coach convinces him to go to college as a walk-on football player. During college he meets a precious brown eyed girl, and they become friends. That all changed when she decides to take the boy by the hand and show him the way. She was different; tall, beautiful, confident, thoughtful, kind, sophisticated, and smart. He is unable to resist the attraction so he follows her. They marry and in the beginning it was a rocky road. As polar opposites there were many heated moments, but in the end true love conquers all. Her gentle guiding influences on the man, their family, and his business career are nothing short of a miracle, so get ready to laugh and cry and be inspired. Mean to Meaningful is chocked full of life lessons and school of hard knocks discoveries. The author even dares to share personal secrets and priceless insider information. A must read for parents, students, and professionals, and it is an invaluable source of ideas for anyone struggling to surmount the obstacles in life that stand between failure and success. 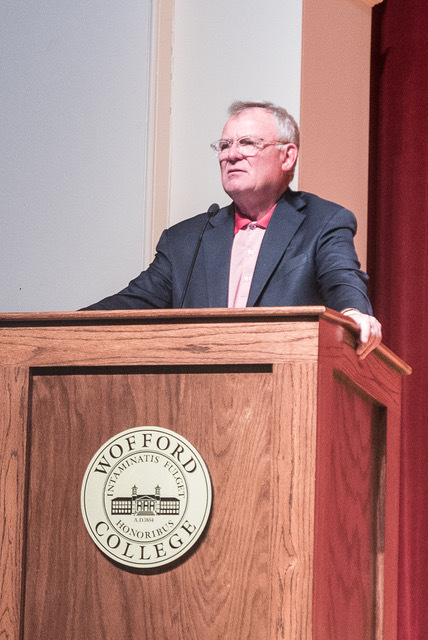 Mean to Meaningful book profits go to Wofford College to provide scholarships for student-athletes, many of whom would not be able to attend college without this help.